Angie, thank you so much for having me here today. I’ve been asked a few times, why a dog? Well, why not? Okay, they’re not quite the traditional vampire hunter but when a Border Collie stares at you with that sheep-herding eye, you know it… and I suspect a vampire would too. Part of why I picked a dog is because of why I wrote the first Doc story. A fellow author was having a flash contest on her forum and she happens to be a huge dog fan. The prompt was involving vampires. At the time, I’d never had much luck writing flash fiction, but she encouraged me to give it a try anyway. I said I would if inspiration struck. Then one day I was out playing with my Border Collie. She stared at the ball in my hand with her ‘eye’ and, well, inspiration struck. The story was so popular (it won both that round and the grand prize round) that I decided to keep up with the series. Not to mention how much fun it is to write from a dog’s perspective – but that’s a different blog post. 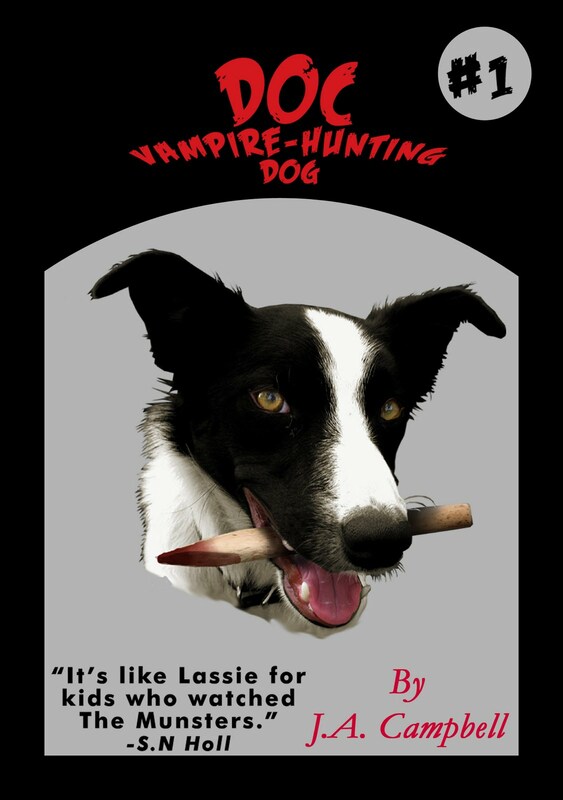 If you think about it, dog’s make great vampire hunters. They don’t really stand out in a crowd, so a human trying to blend in won’t look odd walking a dog. He would look odd walking a big hunting cat, or a wolf, or something else, but not a dog. They are super loyal to their humans and super trainable. You can teach a dog to track a human in the forest, or even in urban settings, so why can’t they track something that has such an obviously different smell. Police dogs are trained to attack on command, so why not vampire-hunting dogs? Different breeds would likely have different styles of assisting their humans. Border Collies use their ‘eye,’ other breeds would likely attack, or chase – like a Grey Hound – or lick them to death, oh wait. LOL. I don’t believe all dog breeds would make good vampire hunters – but certainly breeds traditionally used to hunt or work could be trained to track and possibly even help kill vampires. Dogs also love to have a job. What better job than keeping humans safe? It’s man’s best friend vs. his worst enemy. Or check out his new novella. What a great post! Thanks Julie! As promised, I've randomly drawn a winner for an e-copy of Going the Distance and that lucky person is...Kyla Holt! Yay! Congratulations, Kyla! Love the pic of Doc with a stake in his mouth. And his eyes...he knows no fear. Thanks Julia and Angie. Angela, thanks so much for having me here! Marianne, nope, Doc is a superhero! No fear :) Thanks so much. "Puppy Power" - LOVE it! And I love Doc. Thanks for creating him, Julie. Good girl! Gasp! Tammy, I missed replying to your comment. Sorry. I'm so grateful that she let me guest with her :) Angela rocks! I'm so glad you enjoy Doc's stories.